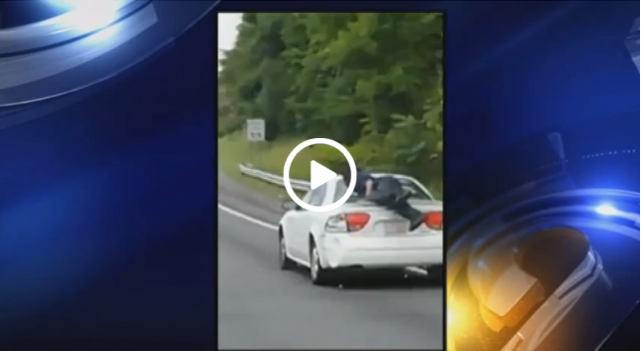 Man Rides On Back Of Moving Car On The Highway – VIDEO. Brenda Cruz was driving with her family on Interstate 77 near Charlotte, North Carolina on Saturday when all of a sudden her kids saw something very out of the ordinary. Luckily Cruz did because this is not something that you see everyday. After recording the incident she also took down the license plate information and called 911 to speak with the state troopers. 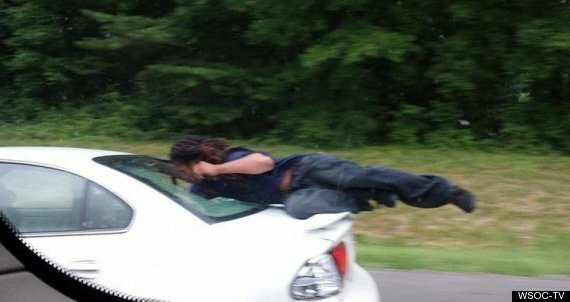 They watched as the man on the trunk of the car not only held on to the vehicle at high speeds, but also managed to shatter out the back window and climb inside the car. Cruz says that the car was being driven by a woman and that there was a child in a car seat inside the vehicle. Its uncertain if the two people in the incident knew each other and that will only be revealed once they can track them down. Several other people also reported the incident on Interstate 77.